ONCE MORE WITH FEELING: Putting yourself in the best light! Many are in denial but there is an excitement that the fall season brings. I won't lie: fall is my favorite season. So enjoy these last few days before the schedule shifts, and the evenings hopefully get a little cooler, and you have time to re-assess how you want to be seen! How do you put yourself in the best light? I was asked by Classical Singer Magazine to adjudicate some of the singers who applied to participate in their first Online Voice Competition. Obviously, the competition is working out its kinks as to how to make this idea work effectively, but for a first time, it was very successful. However, what was disappointing as an adjudicator is how many singers simply didn't put themselves in the best light in their recording process. My colleague, Claudia Friedlander, graciously sent me the Carnegie Hall Musical Exchange guidelines for Joyce DiDonato's masterclass series. You can peruse it here. For an online competition, however, may I suggest some things for you to consider to put yourself in the best light to be seen and heard? These are observations, and in our new digital age, we are constantly learning together! First, you do not need fancy equipment to record with. You just need your smartphone. Look to see what the requirements are - some competitions do not want additional microphone attachments. Follow the guidelines. If there is an option between a video and an audio - ALWAYS choose video. Why? We want to SEE you. You are a singing actor - the story telling, the technical behavior resides in your body. As an adjudicator, I want to see you! Do NOT send in a clip of a live performance. Make this specific for the competition you are submitting for. We don't want to see an audience member filming you between people's heads where you are not front and center in the frame! There should be NO distractions. Please use live piano. This should be a LIVE recording. Pre-recorded tracks do you NO favors. Learn how, or get someone to edit the recording for you. You don't want to walk in and out of the frame and send that in. When the video opens, it should be YOU in the frame prepared to slate your name and what you are singing, or giving yourself those few seconds to let your name/selection come up on the screen if you are really fancy and can add that feature to your finished product. Where should you record? Somewhere with a piano that isn't cluttered. Again, too much distraction doesn't let us stay focused on YOU. The piano/pianist does not need to be in the frame. This is about YOU delivering the performance. You don't want the focus to be so tight that all we see if your head - we want to see how you gesture and use your body. Full body, or 3/4 length is fine. Make sure you don't cut off the top of your head in the frame. Seriously. Try to use a neutral wall/space behind you if possible. Stand away from it - not against it. Wear clothes and colors that enhance you! Dress as you would for an audition: no props, no costumes. Get your hair off your face so we can SEE you! Make sure the literal lighting doesn't create shadows on your face. Give yourself a 5 second count before you start and after you finish so the recording isn't cramped or clipped. 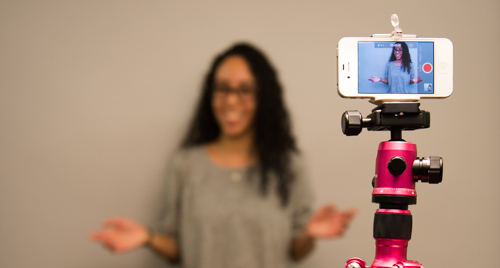 Don't get someone to record by holding your device - even the most steady hand can get a little wobbly! Create a flat surface that captures you comfortably. Don't start walking around. You aren't blocking, you are presenting an audition-like video. If you are moving in and out of the video frame, this doesn't work. If someone is working your camera for you, (as in, pressing "record" and "stop"), they shouldn't be shifting it around to find you. STAY PUT and know the perimeters of space you are working in so you don't wander out of the frame. If you aren't used to doing this - practice! Just start recording yourself regularly - so you get to know what your camera does, what height you want your recording device to be at, how far away/close up can it be so it captures as much of you as necessary, what colors look good on camera, what your "ticks" are - over-gesturing, shifting your weight, looking down, looking up - so you can learn HOW to be in the frame and in your best light! As an adjudicator, I want to see and hear the best YOU - and not see possible potential that just wasn't captured due to a poor recording, or not knowing what is expected in a general audition/competition. Reveal yourself in the most professional way you can. We are all in your corner, but we can't do it for you. Start researching, start watching, just start experimenting to see what you can do. I am a techno-idiot, so if I can do it well, so can you! Put yourself in the best light you can! Excellent advice for today's singer --- these are skills we all need to develop!